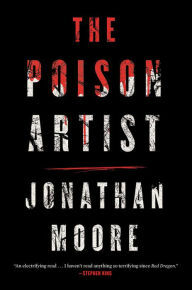 The Poison Artist by Jonathan Moore is a very highly recommended dark atmospheric mystery/psychological thriller. Caleb Maddox has just had a fight with his girlfriend Bridget. She threw a glass at him, which hit his forehead, cutting it open. It looks like their relationship is over. Caleb left the house and is staying at a hotel. After cleaning up, Caleb goes on a bender to mourn her departure. He ends up at a bar called the House of Shields where he meets a mysterious woman who is drinking absinthe. She totally captures Caleb's interest and imagination. Even while he is drinking to excess over the loss of Bridget, he is obsessed with the mystery woman and seeks her out at various bars. Amid Caleb's hard drinking, he hears from his friend, Henry Newcomb, a medical examiner, who has a professional question. Caleb is a toxicologist who also has an ongoing research study into pain and tolerance levels. Apparently while Caleb has been drinking his sorrow away, there is a serial killer loose. Several bodies of males have washed up Henry has a few questions about the lab results they have obtained and wants Caleb to test some of the samples. Caleb also has two police detectives questioning him over a man who was at the House of Shields the night he was there drinking. The action flips back and forth between Caleb's excessive drinking and obsession over the mystery woman and helping Henry with the murder cases. There are a lot of unanswered questions in this moody, pensive mystery. Really, most of the book will leave you feeling like it is set in a dark, gloomy night, with everything hazy and vague - as if the story is incomplete. And it is incomplete for almost the whole novel. You won't learn what Caleb and Bridget fought about for most of the book. While you question Caleb's inexplicable obsession and pursuit of the mysterious woman, you won't actually know the real reason why until the end. The ending is worth all the questions and doubts I had while reading The Poison Artist. I even, briefly, considered setting the book aside because it seemed too vague, but I'm glad I kept reading because the ending was incredible - shocking, dismaying, and frightfully satisfying. Disclosure: My Kindle edition was courtesy of Houghton Mifflin for review purposes.